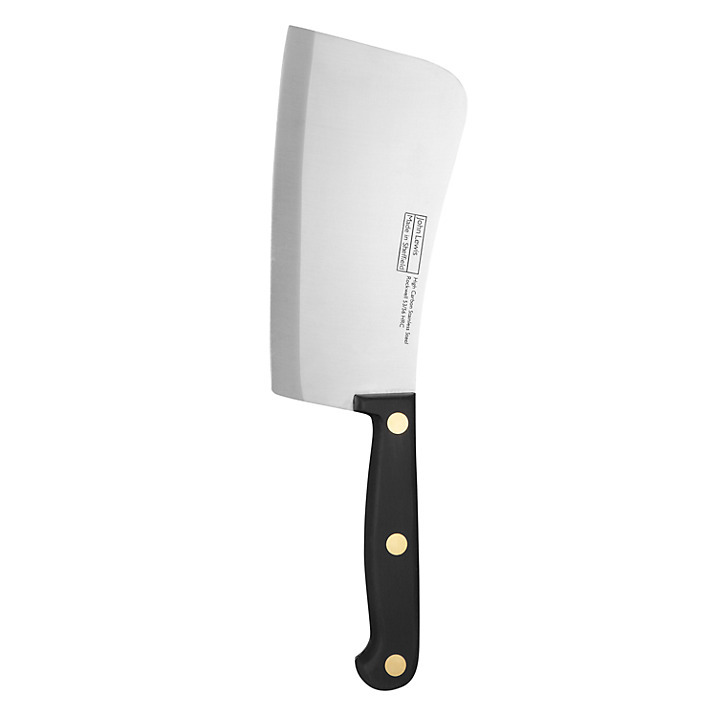 John Lewis Classic Cleaver, 15cm. Made in Sheffield. 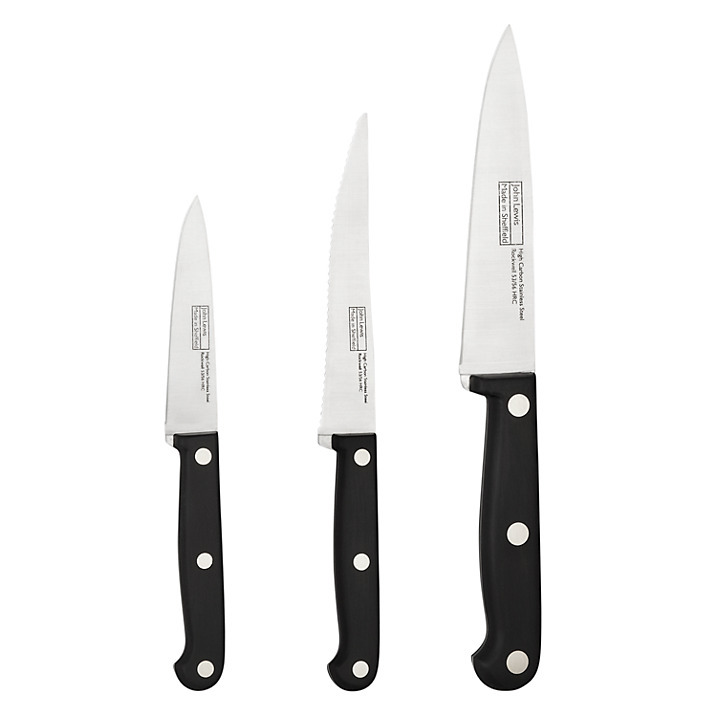 John Lewis Classic 3 Piece Knife Set. Made in Sheffield. Waitrose Cooking all purpose. It says on it “WAITROSE precision ground in Sheffield”. Whilst this knife is “Finished in Sheffield, England, the knife itself is foreign made. This is though a very good knife. Photograph by author. Samuel Stainforth – http://www.s-staniforth.co.uk – have been making knives in Sheffield since 1864 and do a very large range of kitchen knives, chef knives, specialist knives, butcher equipment, survival knives, tactical knives, sheafs, knife wallets for chefs, sharpening tools, box sets, knife blocks, kitchen tools, scissors, accessories and a double handled cheese/chopping knife. Samuel Staniforth Ltd. of Sheffield, England are manufacturers of The Smithfield range of knives. They are all made in Sheffield. We have a Samuel Staniforth Smithfield 6 inch Cook’s Knife. It’s a good weight, very sharp and cuts well. A thing of beauty and function. David Mellor – http://www.davidmellordesign.com – David Mellor cutlery is manufactured in a purpose-designed modern factory in the Peak District National Park. You can visit their factory. The founder, David Mellor, now retired, is a designer and entrepreneur responsible amongst other things for a redesigned UK national traffic light system. Mellor’s design is still in use. He developed a controversial new square post box, and designed minimalist stainless steel cutlery produced in huge quantities for government canteens and NHS hospitals. David Mellor have a shop in Sloane Square in London and another in Derbyshire. They sell lots of stuff but I think only the David Mellor cutlery is manufactured in the Peak District National Park and that lots of the other things they sell are made abroad. However, I think all David Mellor own brand kitchen knives are UK made (please check), as is their silverwear, and their weighing scales. Their cutlery is beautiful. It is not always clear from their website what items are made in the UK so it will be best to ask. Taylors Eye Witness, the Sharpest Knife, 13cm Cooks Knife, made in England. The Eggington Group – http://www.eggintongroup.co.uk – offers high quality Sheffield made knives and sharpening steels. Under the brand name Simply Sheffield make military knives (including the famous British Army Knife), safety locking knives and promotional knives. Whilst under the William Rogers name they made a commando knife (and presentation box). Under the George Wostenholm name they make pocket knives, bowie knives and trade knives. Under the Ibberson name they make yachting knives and kits, action knives, military knives, safety locking knives, trade knives and letter openers. Under the Joseph Rogers brand they make traditional pocket knives, smoker’s knives, letter openers, yachting knives and kits, military knives, British army pocket knives, safety locking knives, and letter openers. Under the Eggingtonbrand they make sharpening steels, cook’s forks and butcher’s saws (and blades). A vintage Geo. Wostenholm & Son stainless steel Sheffield made table knife. George (or Geo.) Wostenholm were also famous for making cut throat razors as well as cutlery (including I.XL cutlery) and pocket knives. The name is now part of the Egginton Group (see above). For a nice OILSTONE AND BOX made in Leicestershire, England try Proops Brothers Ltd on ebay – http://www.ebay.co.uk/itm/350626324112?ssPageName=STRK:MEWNX:IT&_trksid=p3984.m1439.l2649. For an electric knife sharpener try – http://www.catra.org//pages/products/sharpening/MODELEHONE.HTM. A.Wright and Son Limited – http://www.penknives-and-scissors.co.uk – make scissors, cutlery, kitchen knives, pocket knives (they make fab penknives), hunting knives, bushcraft and survival knives. Started in 1947, Arthur Wrights is a traditional Sheffield Pen and Pocket knife manufacturer. Everything is done in-house in Sheffield. The quality of their products is excellent. Arthur Price – http://www.arthurprice.com – Arthur price hold 2 Royal Warrants and sell cutlery, tableware and gifts. Their factory is now in Lichfield, Staffordshire and I think also at the old A.Deeley cutlery factory in Handsworth, Sheffield. Much of what they sell is now produced in the Far East, but I think some of their products are still made in the UK. It is not clear from their website, so you would have to check before buying. R. F. Mosley & Co. Ltd of Sheffield were a manufacturer of cutlery and silverware and is sometimes claimed to be the first firm in the world to produce stainless steel cutlery. They used the brand name “RUSNORSTAIN”. R. F. Mosley & Co continued to operate on their Portland Works site until the late 1950s. After this the company must have closed down. Various other companies were also based at this site. Their old building is now a business centre for small companies. Firth Stainless and “Staybrite” Steel produced by Firth-Vickers Stainless Steel Ltd., Sheffield is perhaps the best know Sheffield cutlery and one of their founding companies, Firth Brown Steels, also lays claim to having invented stainless steel. Sheffield Forgemasters is the successor to such famous Sheffield names such as Vickers, English Steel, Firth Brown and British Steel and are still going strong today, specialising in the production of large bespoke steel castings and forgings, as well as standard rolls, ingots and bars but seemingly not cutlery. The complexities of merging companies and what happened to their famous cutlery are beyond what I have discovered so far in my meagre research into this. 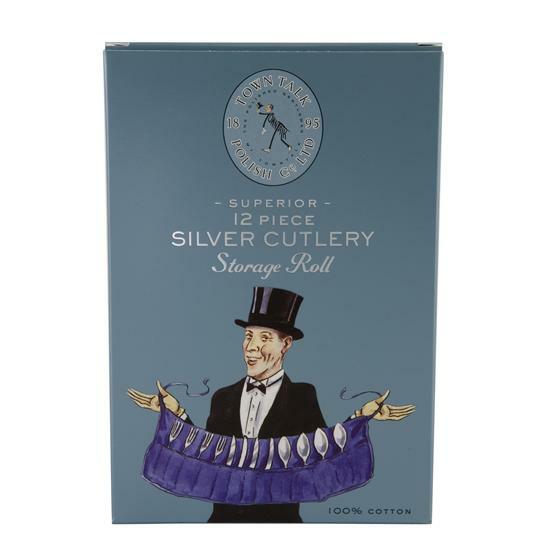 British Silverware Limited of Sheffield – http://www.britishsilverware.co.uk – make bespoke silverware such as trophies, table top ware, cutlery and models and also specialise in silverware for yachts. Chimo Holdings – http://www.chimoholdings.co.uk – trade but available directly to the public from their website http://www.chimodirect.co.uk – Based in Sheffield and they have a factory in Sheffield, Chimo Holdings manufacture cutlery, gallery trays, silver and giftware and promotional merchandise. The company was established in the 1980s, uniting a number of independent Sheffield manufacturers – William Yates (Sterling Silver Cutlery and giftware), Rose White Silverware (cutlery in silverplate & stainless steel plus a range of popular cream handled knives), Tricketts of Sheffield (cutlery and related products for the trade and hospitality industries in silverplate and stainless steel), WRS Cutlerymate (cutlery storage system; made in Germany by ALBEC I understand), Westplate Tray Company (silverware trays, cake stands, tableware punch bowls and cups, candelabra and candlesticks and coasters – http://www.westplate.com – trade only) and they also do cutlery repairs, refurbishment and replacement matching. As always, ask where what you are interested in is made before buying. Sheffield Cutler/Chimo Holdings also have an eBay shop with all the products being made in their factory in Sheffield and these are end of lines, samples or one offs – they have great things on here at great prices such as detachable belt key holders, key ring bottle openers, signs, cufflink blanks, shackle key keyrings, combined knife and forks, magnetic button holders, money clips, dog tags, a Lord’s Prayer Silver Plated Cross Bookmark, coasters, ornate trays, metal rulers, etc. Fletcher Robinson Ltd (C.W. Fletcher (Silversmiths) Ltd, as was) – http://www.fletcher-robinson.co.uk – exclusive quality flatware (cutlery) hand forged in Sheffield, England. Francis Howard Silversmiths – http://francishoward.co.uk – trade only – photo frames, christening gifts, barware, tableware, gifts and desk items – made in Sheffield since 1870. Carrs Silver – http://www.carrs-silver.co.uk – trade only – British-made silverware and cutlery – Silver giftware, table top ware, photo frames, children’s gifts, wooden picture frame backs and cutlery storage boxes, silver plated products and cutlery available in department stores and small shops. They area a volume manufacturer and also produce for others. They also own Osbourne Cutlery. Carrs silverware and Osbourne Cutlery is made in Sheffield, England. J.Adams Ltd (Sheffield Knives) is a family business which has been making good quality knives for six generations. They are also the parent company for three other long established brands F.E. and J.R. Hopkinson Ltd, established 14 June 1944; John Nowill and Sons Ltd, whose corporate name was granted by the Cutlers Company of Hallamshire on 27 April 1700 and Austin McGillivray and Co – http://www.sheffieldknives.co.uk – they make pocket knives, kitchen knives, cook’s knives, butcher’s knives, trade knives, scissors, hunting knives, survival knives, bushcraft knives and specialist knives. Granton Knives – http://www.granton-knives.co.uk – manufacture all their knives in Sheffield, England. They make kitchen knives including their famous Granton Edge knives, plain edged knives, serrated edge knives, palette knives and colour handled knives for the professional and the home – trade only. Granton Medical – http://www.granton-medical.co.uk/special_needs.html – make a range of Sheffield made special needs cutlery designed to help individuals with disabilities with eating. Kutrite/Ernest Wright & Son – http://www.ernestwright.co.uk – British made scissors – Ernest Wright and Son Limited is a family company hand-making scissors and shears in Sheffield, England since 1902. Their scissors and shears come with a life-time guarantee. They produce scissors for art and craft, gift, ceremonial and gold plated scissors, dressmaking, tailor and clothwork scissors, embroidery and fine craft scissors, garden and floral art scissors, kitchen scissors, nail and personal care scissors, office, general and left-handed scissors, and professional and trade scissors. Ernest Wright and Son went bankrupt towards the end of 2018 and since then a pair of Dutch entrepreneurs bought the company and have re-launched it in the hope of keeping it going, albeit with the prices considerably inflated. These vintage nail scissors are marked “Made in England”. Not sure who made them. Photograph by author 1 October 2017. These vintage nail scissors are marked “Empire Forged”. Not sure who made them. Photograph by author 1 October 2017. Presumably they were made somewhere in the British Empire, but not the in the UK. A few years ago, perhaps up to the 60s or even 70s, some products such as cutlery and china, were marked England (meaning made in England), Empire (meaning made in one of the countries that were part of the British Empire) or Foreign (meaning made abroad, but not within the Empire). At least that is what I assume these markings on some cutlery and other goods mean. W.Wright Silverware – http://www.wwrightsilverware.com – trade only – manufacture silverware in Sheffield, England supplying hotels, restaurants and catering companies and are a major supplier of E.P.N.S. cutlery (used for silver service) in Sheffield, including branded cutlery, as well as supplying products made by others in the UK and abroad. As far as I can gather their cutlery, silverware and some of their china is made in the UK, but it is not clear from their website so please check the items you want are made in the UK. Inkerman Silver (Samuel Eales Silverware Ltd) – http://www.inkermansilver.co.uk – Made in Sheffield, UK – Suppliers to the catering industry of cutlery and hotelware manufactured in Sheffield – sterling silver cutlery, silver plate cutlery, stainless steel cutlery, cutlery canteens and cabinets and tableware. 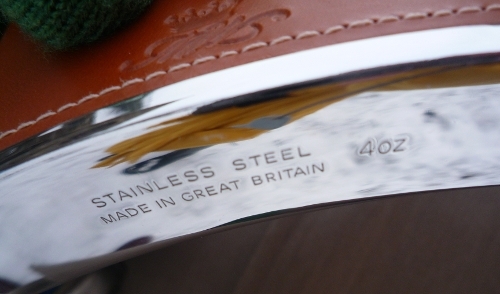 All their cutlery and cabinets are made in the UK and marked Made in Sheffield. Inkerman also manufacture cutlery for others, including cutlery branded with their clients name. William Whiteley & Sons (Sheffield) Ltd (incorporating Thomas Wilkinson & Son, Manufacturers of Tailors Shears and Scissors) – http://www.whiteley.co.uk – British made scissors – Founded in 1760 William Whitley produce scissors for advanced composite materials, carpets, upholstery, gift, ceremonial and gold plated scissors, hairdressing, household, general purpose and DIY scissors, nail scissors, industrial scissors, lightweight plastic handled scissors, rubber cutting scissors, safety scissors, surgical scissors, nursers scissors, textile scissors, dressmaking scissors and tailors shears. 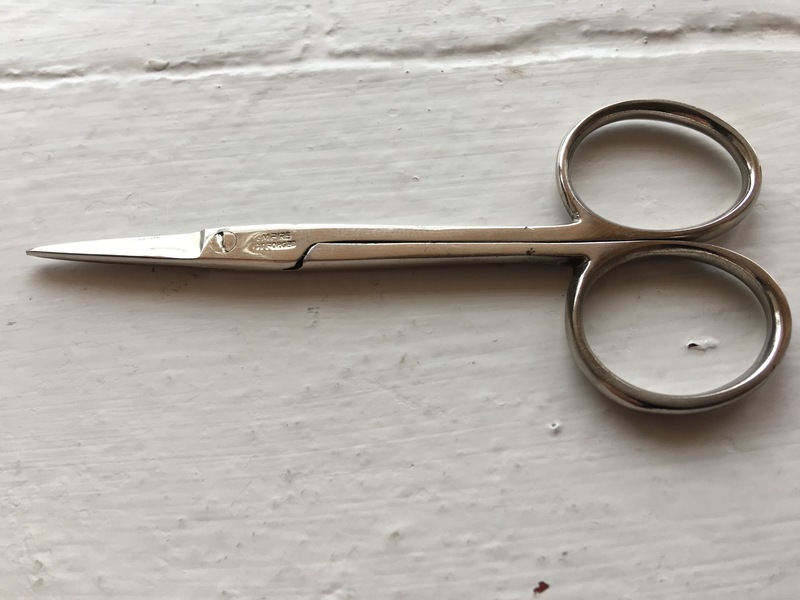 Merchant and Mills – http://merchantandmills.com – sell a range of Merchant and Mills branded Sheffield made scissors and tailor’s shears. Slater Knives (Herbert M. Slater (1853) Ltd.) – http://www.slaterknives.co.uk – are still made in Sheffield (some goods are marked as imported on their website, so obviously not these ones – for example their Machette is imported, as is their tramontina range, some cutlery, knives and bread knives but everything else from Slater is made in the UK) – makers of kitchen knives, butchers knives, cooks knives, steels, choppers, forks, s-hooks, skewers, needles, scrapers, scissors, saws, palette knives, fish trade knives, trade knives, pocket knives, sheaf knives, scout knives, Skien Dhu and cutlery. Prices are very reasonable (you need to add VAT and postage to the prices shown on their website). I own a Herbert M Slater butchers knife, butter knife and a pair of their kitchen scissors and the quality is excellent. Hiram Wild (and United Cutlers) (J & C Products) – http://www.hiramwild.com – Stainless Steel, silver plated and silver cutlery made in Sheffield, England. Trade only. Hiram Wild is the UK’s largest volume cutlery manufacturer. William Turner – http://www.williamturnersheffield.com – Stainless Steel, silver plated and silver cutlery wholly made in Sheffield, England. Abbeyhorn – http://www.abbeyhorn.co.uk – Slightly off track this but Abbeyhorn make gifts, tableware, kitchenware, silverware, homeware, and the like in Lancashire all using natural horn. B.D.G. Manufacturing Ltd – http://www.bdgmfg.com – Producers of awards, trophies, cutlery, flatware and hotelware for the trade. Factory in Birmingham. Pinder Brothers (inc. Warriss & Co.) – http://www.pinder.co.uk – Cutlery and silver holloware plus a full range of pewterware, almost all made in Sheffield. Trade only. 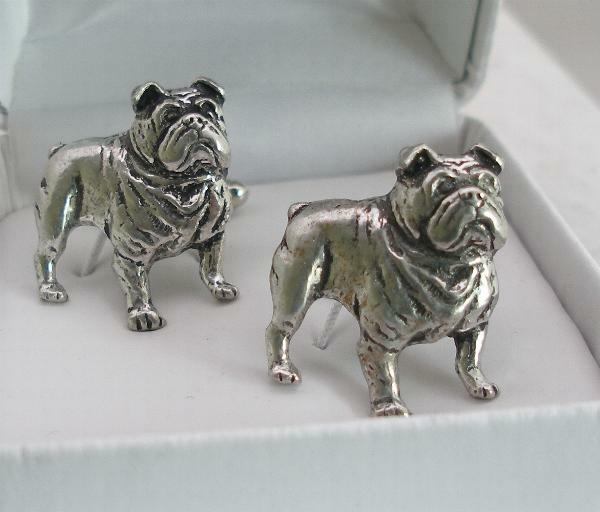 British Bulldog Cufflinks in Fine English Pewter at Hoardersworld. Made in England. 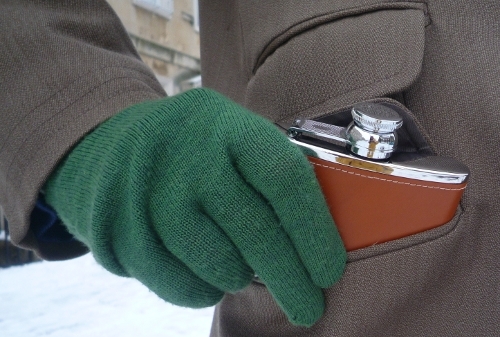 4oz hip flask by Marlborough World. Made in England. Photograph from the Tweed Pig. 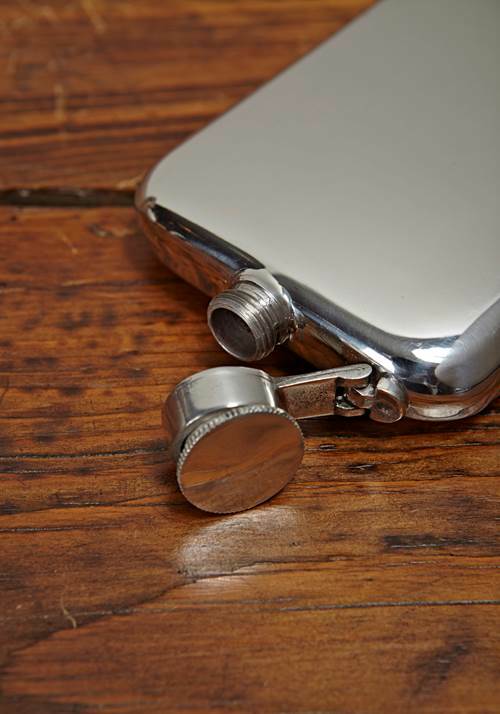 4oz hip flask by Marlborough World. Made in England (base view). Photograph from the Tweed Pig. 6oz Kidney Hip Flask in Sheffield Pewter. Made by Wentworth for Lissom & Muster. Made in Sheffield, England. 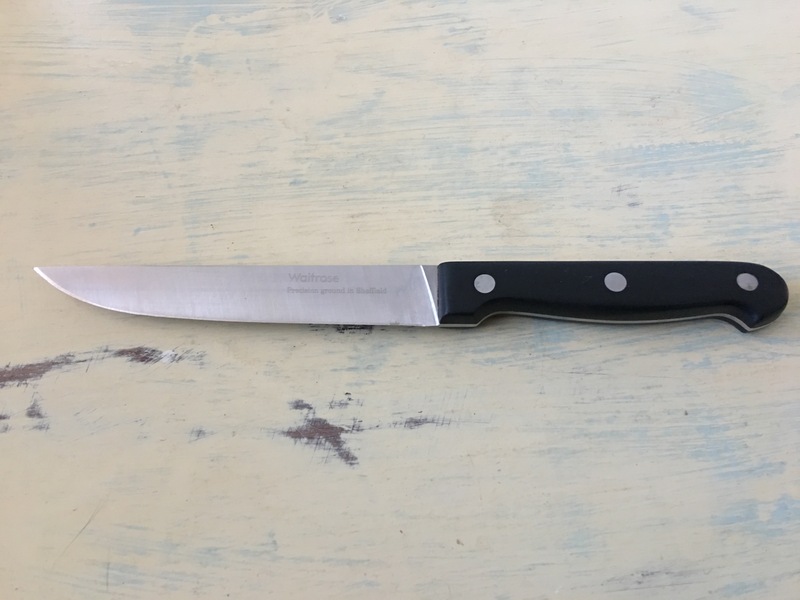 William Abdy – http://www.williamabdy.co.uk/ – have a range of Sheffield made cutlery and knives. The rest of their products are made outside of the UK. 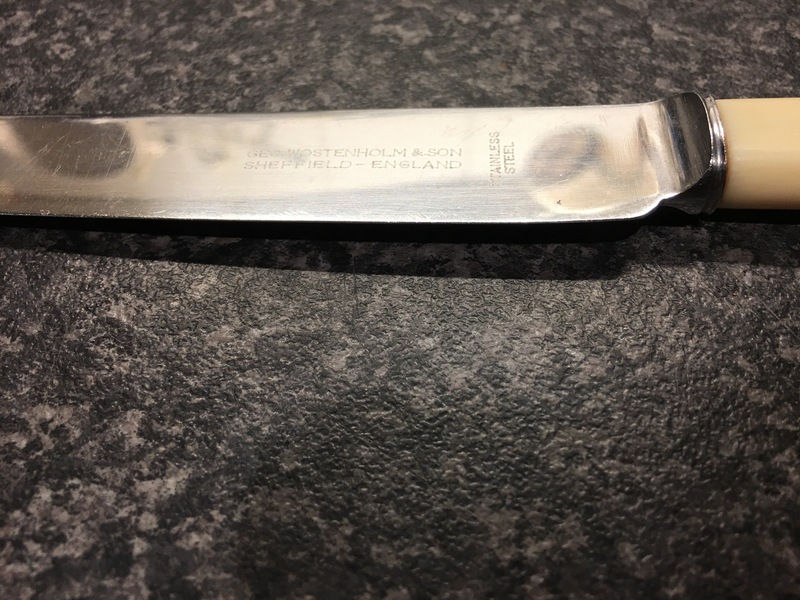 R & R Sheffield Cutlery (R & R Polishing) – http://www.randrsheffieldcutlery.com – manufacture (or have manufactured for them) made in Sheffield cutlery, giftware, sharpening steels, hunting knives and pen knives, in stainless steel, silver plate and silver in Sheffield, England. SheffieldCutlery.com (Yates Brothers) – http://www.sheffieldcutlery.com – trade only – manufacture cutlery components and are one of Sheffield’s major suppliers to cutlery manufacturers. William Yates – http://www.williamyates1750.co.uk – manufacture sterling silver table cutlery in Sheffield, England. Thessco Limited – http://www.thessco.co.uk – manufactures silver brazing alloys, metal joining products and industrial silver alloys in Sheffield, England. They have their own silver refinery. Blok Knives (Ben Edmonds) – http://www.blok-knives.co.uk – premium hand made kitchen knives made in Derbyshire. Another seller on eBay is “motornutter2011” – http://www.ebay.co.uk/itm/TRIMMERS-NASAL-EAR-EYEBROW-BLOKES-SCISSORS-FOR-MEN-AT-LAST-MADE-IN-UK-/190866518683?pt=Shaving&hash=item2c7087f29b – UK made “blokes” flat-ended scissors. and http://www.ebay.co.uk/itm/Nurses-Pocket-Scissor-on-chain-Blunt-Sharp-points-Made-in-UK-best-there-is-/181171204170?pt=UK_BOI_Medical_Lab_Equipment_Medical_Equipment_Instruments_ET&hash=item2a2ea5304a – UK made nurses scissors with chain. Another seller on eBay is “brandcentre” – http://www.ebay.co.uk/itm/Taylors-Eye-Witness-Stainless-Steel-Poultry-Shears-Kitchen-Scissors-Made-in-UK-/360601172033?pt=UK_Kitchen_Accessories&hash=item53f5813841 – Taylor’s Eye Witness British made poultry shears. Don’t buy Richardson Sheffield; their knives are no longer made in the UK. The company retains ‘Sheffield’ in its name which is an outright deception of British consumers and should not be allowed. Viners were bought out several years ago by Oneida (http://www.oneida.co.uk/), a US company. I believe all their cutlery is now made in China. Town Talk Polishing Co. Ltd. make cutlery storage rolls in England. Please see my separate article on British made pocket knives, survival knives, bushcraft knives and safety knives – there is some crossover with this article. For some information on Knife Law please see that article too. British made kitchen knives. British made cutlery. British made scissors. British knives. Knives made in the UK. UK made knives. UK made scissors. UK made cutlery. Kitchen knives made in the UK. Scissors made in the UK. Cutlery made in the UK. Sheffield Cutlery. Sheffield knives. Sheffield scissors. Sheffield made scissors. British made chef’s knives. British made cook’s knives. Knives made in England. English made knives. Airport knife restrictions. I bought a full stainless steel canteen and additional items from United Cutlers some years ago believing them to be of good quality and assured by an unconditional lifetime guarantee. Unfortunately the knife blades have begun to separate from the handles. United Cutlers are now known as Hiram Wild/ J&C Products and they tell me they have no liability in respect of this guarantee and generally have been less than helpful. Can anyone tell me whether this is correct or offer any other advice please. This is how it goes here in the UK. Bad Luck. However it is practice to fob off customers with tell-tale excuses. The average British customer would go away and accept what they are being told. It’s just the complacent mentality that they can’t be bothered to put in the energy for a fight. Stick to your guns, ask to have it explained to you by a supervisor. Don’t go away and keep pushing. However I am not sure if a lifetime US style warranty is legal in the EU. I believe it’s considered misleading because it raises the question what lifetime refers too. Your lifetime or the products life-time or even the manufacturers life-time. Most likely it refers to product life-time and this can be finished when a manufacturer decides to no longer make the product and hence support seizes. Continuity is NOT a British strength. I have German inherited cutlery and I could still buy spare knifes & forks 45 years on when my family expanded. It’s made by ALBEC in Germany. Edward and Tony – Thanks for your comments. I have amended some of the above after your comments. Edward, I don’t have any advice for you I’m afraid but what Tony says makes good sense. Totally agree. The volumes of quality scissors made in Sheffield are high. What you can’t do these days of course is walk into into any British supermarket or corner shop or High Street shop and buy British made scissors. They simply do not sell them. My husband and I received a set of eight Wilkinson Sword (made in Sheffield) knives 27 years ago. We have used them constantly, washed them in a dishwasher, and never sharpened them. Amazingly, they are still sharp! They are by far the best knives we’ve ever owned. Sadly, all but three of them have been lost over the years. I’d love to find another set but they are hard to come by. Ebay sometimes has them, but rarely the ones made in Sheffield. I would replace them with something similar, but have no idea what maker/company to go with. What would you recommend? Thank you in advance. I think Wilkinson merged with Whiteley, and now only make scissors. Hi. I think you are right. Thank you. Well thought of. 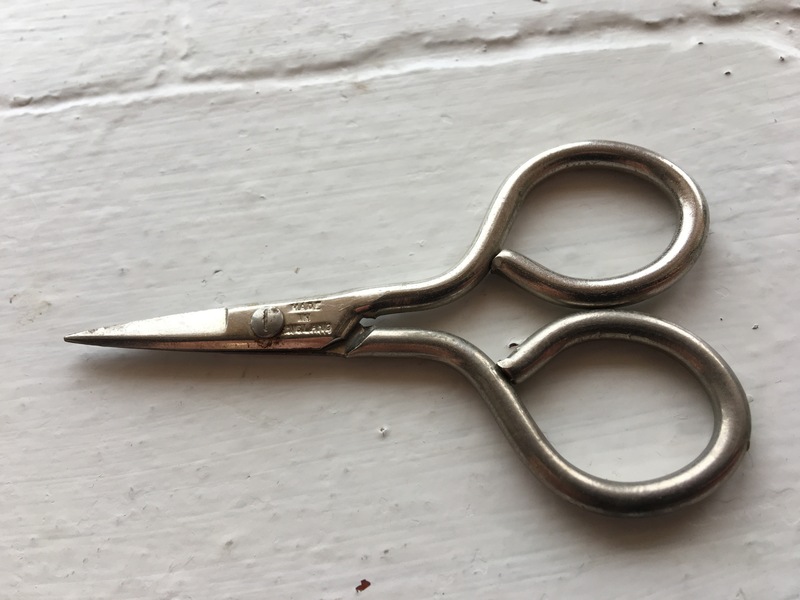 The Wilkinson name is still used on some Whiteley scissors and they describe themselves as William Whiteley & Sons (Sheffield) Ltd (incorporating Thomas Wilkinson & Son, Manufacturers of Tailors Shears and Scissors). The firm of Thomas Wilkinson was acquired by the then William Whiteley in the year 1875. Now I don’t know what connection, if any, there is between Thomas Wilkinson and Winkinson Sword. Do you happen to know? According to Wikipedia Wilkinson Sword product lines have included guns, bayonets, and implements such as typewriters, garden shears, scissors, and motorcycles and razor blades and razors. The company is now owned by Energizer Holdings and all production is abroad. The last Wilkinson Sword factory making razors in the UK was closed down in 2000 and in 2005 the sword making in London was closed with the equipment being sold to a German company and an Indian company. So, despite the name, Wilkinson Sword do not even make swords. There is also a garden centre called “Thomas Wilkinson & Son” in Keighley in West Yorkshire; probably no connection to either. I guess perhaps Kathy’s knives were actually made by Wilkinson Sword but I’m not sure and can’t find much on the history of the Wilkinson name. The Wilkinson Sword name is still used on some gardening tools but I don’t know who makes them, but possibly the name is still owned by Fiskars? Samuel Staniforth Made a Range of Knives for Wilkinson Sword in the late 80s / 90s. I’m afraid I don’t know anything about Royse Bros but it would be interesting to find out. I hope someone else will be able to answer your question. Hi. A great website I’ve only just found. Waitrose / John Lewis sell John Lewis branded kitchen scissors made in Sheffield. Hi. Thanks. And thanks for pointing out the made in England JLP knives. Good to see them selling these. I have updated my article. apparently thesamuel staniforth “peeler is from Nogent in France”.So much for S Staniforth “MADE “PROUDLY” IN SHEFFIELD SINCE 1864”.Is it so hard to put coiuntry of origin next to every product? Thanks for your comment and sorry it has taken so long to respond. I often find it is hard to find what you want and suppliers, disappointingly Samuel Stainforth in this case, often seem to go out of their way to mislead customers about where products are made. Delfinware sits nicely with another company British Drainers and I have written about them at https://ukmade.wordpress.com/2013/05/28/british-drainers-dish-drainers-washing-up-racks/ Thank you for the information. Which manufacturer would you suggest me for a brand new cutlery canteen? I would like an high-quality, Sheffield made canteen, for an everyday use. I don’t really know. I think buying quality British made is a good idea though. There are plenty to choose from. Look at their websites and see what takes your fancy in your price range. Think about size too. I would personally steer for a plainer and more simple design, but you might think differently. Good luck choosing. Let me know you what you choose if you have the time.